March | 2014 | Live Healthy S.C.
Hospital-associated infections continue to be a serious public health concern. A new study released by the CDC this week reveals that 4 percent of patients develop a new infection while hospitalized, 11 percent of which turn deadly. Here at DHEC Public Health, we provide data surveillance and reports on healthcare-associated infections (HAIs) to help health care organizations identify problems and track trends. Our healthcare-associated infections epidemiologist Kate Habicht does a great job overseeing this data collection and reporting to the 78 hospitals in South Carolina that are required to report this information under the Hospital Infections Disclosure Act (HIDA). Kate also provides support to the S.C. Hospital Association, which is the organization in our state that leads healthcare-associated infection prevention initiatives. Each year, DHEC produces two reports on facility-specific HAIs that are distributed to hospitals and legislators, and is available to the general public on our website. These reports provide consumers and public health officials with a way to measure and compare South Carolina’s progress in preventing HAIs. They also help to promote better infection control practices across the state. Special thanks to Kate for her hard work in monitoring and reporting HAIs. Her work is helping South Carolina health care providers identify ways to prevent these infections in the future. This entry was posted in Disease Control, Prevention and tagged hospitals, infectious disease, prevention, South Carolina, statistics on March 28, 2014 by SC DHEC. Today is National Diabetes Alert Day, a day on which the American Diabetes Association (ADA) stresses the importance of learning your risk for developing type 2 diabetes. Here in the Palmetto State, 1 out of every 5 hospital patients has diabetes. In 2012 alone, diabetes hospitalizations in South Carolina cost more than $280 million. One of the most notable risk factors for diabetes is your weight. Being overweight or obese can significantly increase your chance of developing diabetes. That’s why here at DHEC we’re focusing on promoting programs that address both diabetes and obesity, like the CDC-led national Diabetes Prevention Program. Take a moment to take the ADA’s quick, online risk assessment tool that asks simple questions to help identify your risk for developing diabetes, and visit our website for tips on how to prevent diabetes. This entry was posted in Chronic Disease and tagged diabetes, obesity, prevention, South Carolina, statistics on March 25, 2014 by SC DHEC. Today is World TB Day, which provides the CDC and health departments across the country with an opportunity to raise awareness about tuberculosis–related challenges and solutions we’re implementing to prevent and control TB. 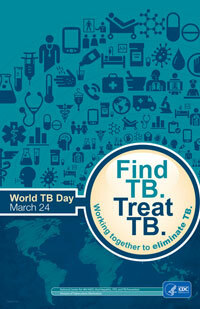 Worldwide, the CDC estimates that 1 in 3 people have been infected by the germ that causes TB. About 10% of people infected with the TB germ will develop the disease at some point in their lives. Here in South Carolina, we’re fortunate that TB disease is rare. Over the last decade, we’ve seen a dramatic drop in TB cases reported to DHEC. In 2013, there were 112 TB disease cases reported in South Carolina, which marks a sharp decline from the 233 cases reported in 2004. This entry was posted in Community Health, Disease Control and tagged clinical services, infectious disease, prevention, tuberculosis on March 24, 2014 by SC DHEC.